In ministry all you have is trust. There are no promises of wealth, power, or property. Most move away from home and place themselves at the complete mercy of the local church. The mortgage, the food you feed your children, braces, the car payment, etc, they have to trust the church to do what they said they would do regarding salary, benefits, etc. But the church also expects to be able to trust the staff person. So, when it is all-said-and-done it all boils down to trust. 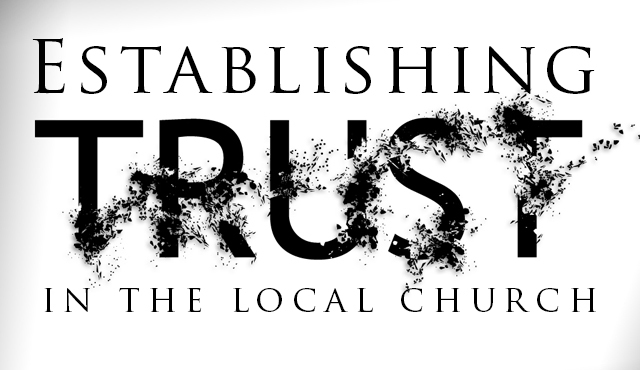 If the church does not trust their pastor or the pastoral staff or they do not trust each other then growth, planning, stability, or even team cohesion is greatly limited or eroded. A. Â Consistently doing or exceeding their job expectations over a period of time. Even little things like being prepared for meetings, being on time, doing what you say you will do. B. Â Maintaining oneâ€™s character and moral moorings over time. This may include not being alone with someone of the opposite gender that is not in your family, telling the truth even when it makes you look bad, etc. Yes, you will sin, but there should a regular practice of praying, Bible study, repenting, and making things right with other people. No one expects you to be perfect (if they do then it is unreasonable) but you should be growing in your walk with the Lord like all other Christians. C. Â Being able to balance family, marriage, and ministry over time. They may not like that you said â€œnoâ€ to something they asked you to do on your day off, but they will respect that you are guarding your family time. Again, you are not always going to get it right at home with the family â€“ but there should be learning how to make it work. Your family is more important than your ministry. Please go back a reread that last sentence. Once you leave a church, in five years they wonâ€™t even remember your name, but your kids will remember you as dad forever. Itâ€™s up to you to determine if it is a good memory or a bad one. D. Â Communicating what you are doing to others; i.e. staff, boards, elders, deacons, parents, etc. If you are not communicating in the gaps, then people will fill in the gaps with their own assumptions. And people naturally tend to be negative in their assumptions no matter how long or how faithful you have been. Does the church, pastor, staff members, etc. know what is going on? What is the mechanism that you use to keep people informed and is it consistently updated (i.e. Facebook, e-mails, staff meetings, etc.)? Once you have an opportunity and privilege to minister to others, then do it to the best of your ability and continue to do so for a long time. This is a good way, if not the best way to gain trust. One should not expect trust to be there the moment you put your books on the shelves in your office. It will take time, especially if your predecessor was not trusted or had to leave for nefarious reasons. When one takes a position where this may have happened then you should expect to inherit the distrust that is there for the man before you and to climb the mountain of trust to even be able to do your current position. I have several friends who are in this situation and are incredibly frustrated because of even after years of faithfully doing their job, the church still does not trust them. Any staff position candidate could ask, â€œWhat actions have the church taken to intentionally deal with the broken trust that has taken place?â€ And â€œhow will the church help the incoming pastor/staff to rebuild this broken trust?â€ If no action has taken place, or they donâ€™t see it as their responsibility to help in this situation then the church does not understand how this will affect the incoming staff person. Letâ€™s be honest. Everyone in ministry makes mistakes and blunders. The only way to avoid this is to never do anything new, stay with whatâ€™s safe, take forever to make decisions, and not take any risks. But these actions (or lack of them) will eventually catch up with the leader in a negative way and they will be criticized anyway. Songs grow stale, programs loose enthusiasm, and people get bored. But letâ€™s assume that you are an awesome leader and want to lead toward new horizons and reaching new people for the gospel. So what do you do if you have done all of these things (faithfulness + time = trust) consistently over a long period of time and you are still not trusted? Why is it that I donâ€™t feel that I am trusted? Are you in a position to where you should be included in certain information loops, budget discussions, or whatever the topic may be? Figure out if what you are feeling is genuine or have you jumped to a false expectation? Sometimes our feelings can guide us to false expectations. What actions have been taken to make you feel that you are not trusted or excluded? Can you give specific example? If so, write them down and begin to look for opportunity s to talk with the leadership about these instances. One of the main keys to building trust is time on the field. Has a reasonable amount of time passed to where people should trust you? If you have only been there a few months then you should not expect to be trusted yet (but you should be taking advantage of the honey moon period: see below). If you have been there more than two years and are still not trusted then there is a problem and you should spend some serious time trying to figure it out why. Knowing where that balance should be is a matter of prayer and calling to a specific place of ministry. If your predecessor was dismissed then expect that time period to be even longer. What blunders have you made and are these things big enough to push back the timetable of trust? Every new staff person is given a few tokens to spend (they are free during the honeymoon period) Every time they do something well they get more tokens. But to take action they have to spend tokens, and the bigger the action the more tokens it costs. So to take big actions they can cash in all their chips and if it works, then things are wonderful. But if it fails they are tokenless and have to save up (over time) more tokens. It may take a long time to rebuild the savings after a big blunder. Let me caution you against using phrases like, â€œThe Lord has told me we should do this . . .â€ or â€œIâ€™m the pastor, staff position, etc. and I say this is what we should do!â€ You have a direct link to the Lord through prayer but so does the rest of the congregation.